Why are The Dance Movement running Thrive Dance Academy? 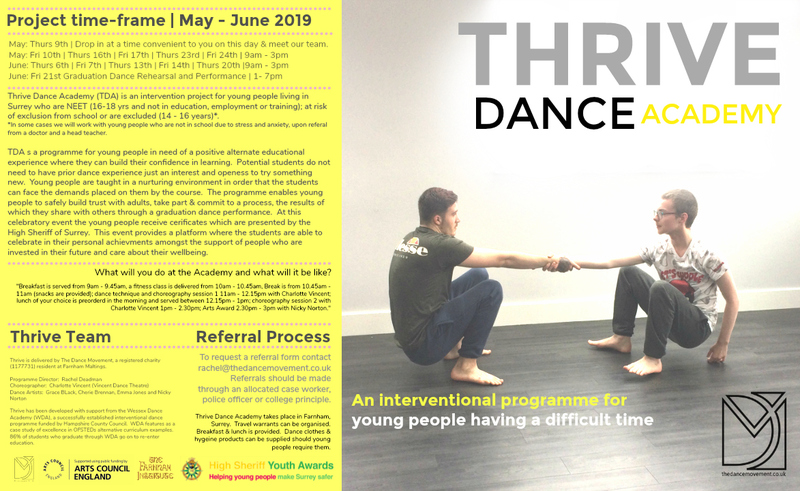 Thrive Dance Academy is an intervention project for young people living in Surrey who are NEET (16-18 yrs and not in education, employment or training); at risk of exclusion from school or are excluded. The first pilot of the project was delivered in October 2018 and served to test out the feasability of delivering a longer-time interventional programme for young people in need of a positive alternate educational experience that can help them build trust with adults, take part & commit to a process through which they might celebrate in their personal achievments & be celebrated by others. Following the successful pilot in October 2018 the next programme begins on Thursday 9th May and culminates on Friday 21st June (Thursdays and Fridays only). Who is running Thrive Dance Academy? Thrive is delivered by The Dance Movement, a registered charity ( 1177731) resident at Farnham Maltings. 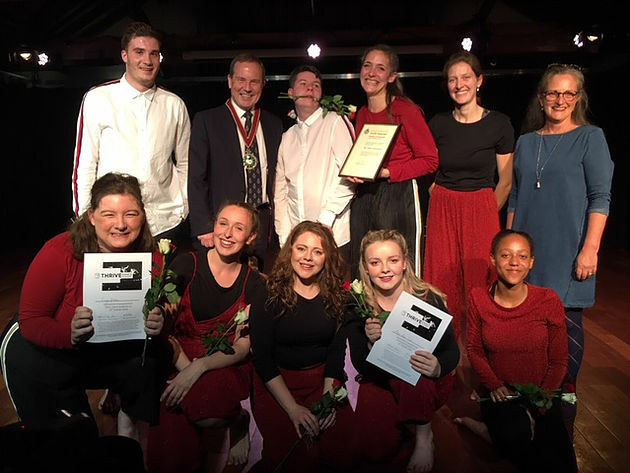 Thrive has been developed with support from the Wessex Dance Academy (WDA), a successfully established interventional dance programme funded by Hampshire County Council based in Winchester. WDA features as a case study of excellence in OFSTEDs alternative curriculum examples. 86% of students who graduate through WDA go on to re-enter education, training or employment. You will join us at Farnham Maltings on Thursdays and Fridays in May and June (not including half-term). Starts 9th May; ends 21st June. You will dance every day, this will include a daily morning dance class, fitness, and afternoon choreography sessions. You will be supported and nurtured by our exceptional team of dance artists. You will not be given up on. You will perform in your own graduation dance show at the end of the programme. You can work towards a Bronze Level Arts Award. Breakfast and Lunch will be provided for the students. Dance clothes, costumes for the performance and hygiene products will be provided if required. Travel warrants can be organised through Surrey CC. This project is modeled upon the Wessex Dance Academy, who have very kindly held our hand through the setting up of our pilot programmes.